In light of the recent media spotlight on the Clinton Foundation, AGRA Watch investigated the relationship among the Clinton Foundation, AGRA, and the Bill and Melinda Gates Foundation (BMGF). It was soon revealed that the Anchor Farm Project of the Clinton Development Initiative is a link between these three organizations. 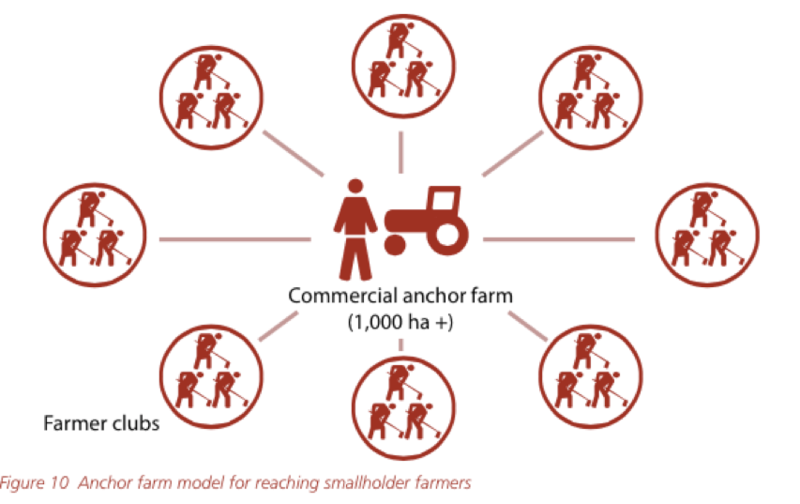 As our report illustrates, it is another push by BMGF to penetrate African agriculture. Although Anchor Farms is the project of the Clinton Foundation’s Clinton Development Initiative (CDI), it is directly funded by the Gates Foundation’s subsidiary AGRA under the Soil Health Program for the stated purpose of “improving the productivity of maize and soya beans through integrated soil fertility management and better access to markets.” The project establishes large commercial farms, called “Anchor Farms”, in rural areas. At the farms, the Clinton Foundation staff trains local farmers in commercial farming practices and mediate loans between commercial banks and the farmers for the needed equipment and inputs. This move by the Clinton Foundation to get involved in African agriculture is of concern to AGRA Watch and our African allies. First, the project promotes commercial and export-oriented agricultural practices. The CDI pushes the purchase of modern equipment, certified seed, and fertilizers under the guise of “modernization” or a claim of higher returns to the farmers. This is the same emphasis that has already resulted in farmers’ debt and dubious returns. Second, no evaluation of the impacts has been conducted with the sole exception of a BMGF-funded study on yield and income alone. An independent and holistic evaluation that includes the effect on farmers’ sovereignty, local economy, and environment is needed. AGRA Watch supports the self-determination of smallholder farmers in Africa without the interference of corporate entities like the Gates and Clinton Foundations. Posted in Bill and Melinda Gates Foundation, Clinto Foundation, Reports and tagged agra, AGRA Watch.